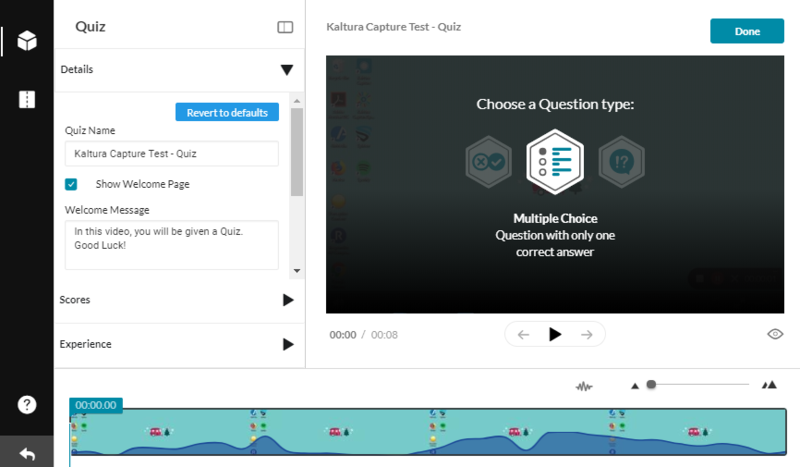 The Kaltura Capture software offers a unique tool that allows you to add quiz questions into an existing video. 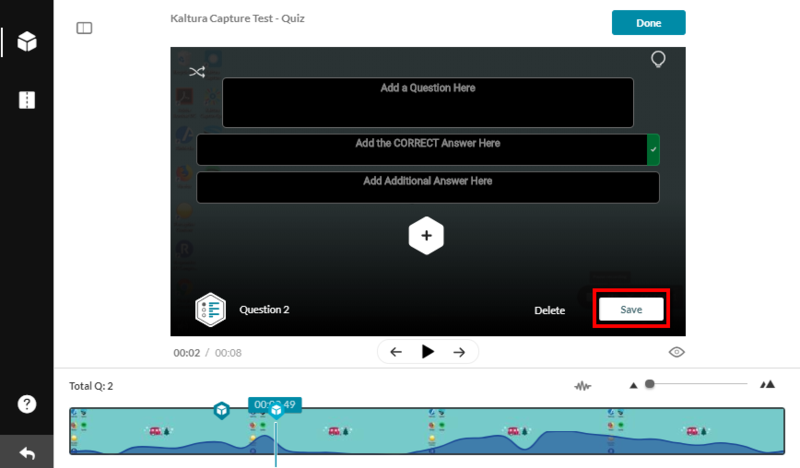 This tutorial will walk you through how to add quiz questions to your Kaltura Capture video. 4. Click the quiz tool button on the left side of the window that looks like a box. 5. To begin making the quiz select the "Start" button. 6. This opens a new screen. Select question type or the details, scores, or experience drop downs to change the preset settings of the quiz. 7. Details allows you to rename the quiz and change the welcome message. There are also options to allow students download the list of questions and to display the instructions "All questions must be answered. The quiz will be submitted at the end." The default welcome message is "In this video, you will be given a Quiz. Good Luck!" If you wish to undo the changes you made, click the "Revert to defaults" button. This is the same under the Scores and Experiences drop downs. 8. The Scores drop down gives you the option to show or not show students their scores after they submit the quiz. You can also choose to include the answers to the questions. 9. The Experience drop down gives you the option to turn on or off the ability for quiz takers to change their answers. 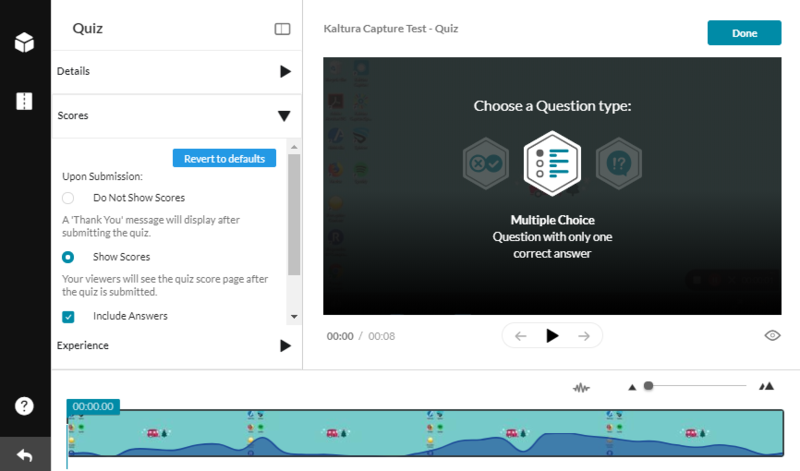 You can also allow or not allow quiz takers to skip questions. Lastly, you can turn on or off the seek bar to navigate the video. 10. 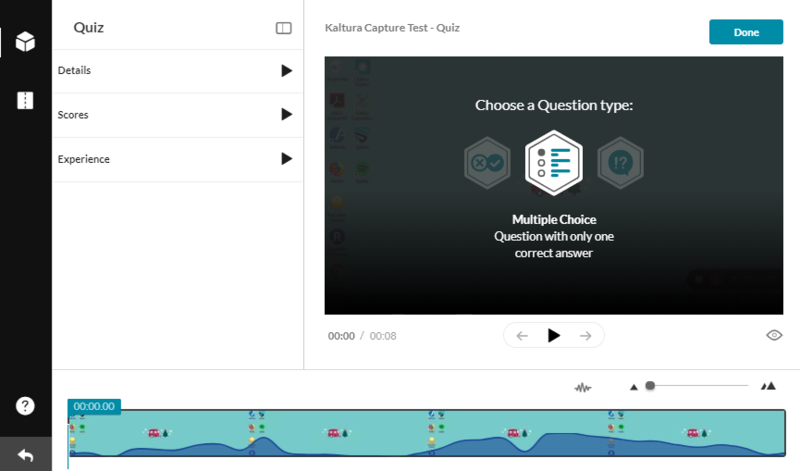 Begin by clicking on the question type that you would like to add to your video. Currently the only question type available is multiple choice. The question will be added wherever the time cursor is at on the video timeline. If you wish to move the location of the question, click the quiz icon in the timeline and drag to a new location. 11. 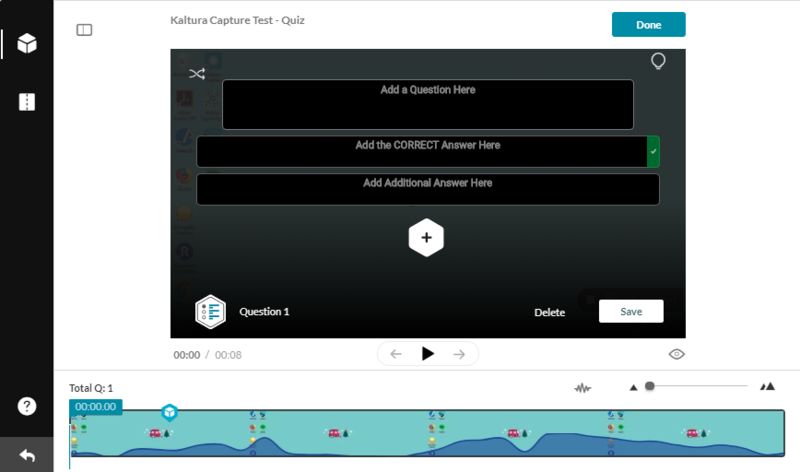 The next screen will allow you to type your question, the answers, add a hint or why the answer is correct, and shuffle the answers. The text boxes give you space to enter the question and answers. The box with the green check mark is the correct answer. If you wish to add more question options, click the + icon. The shuffle icon located in the top left corner randomizes the order of the question answers. The lightbulb icon in the top right allows you to add a "hint" or "why" the answer is correct. 12. Once you are finished with you question, click "Save." 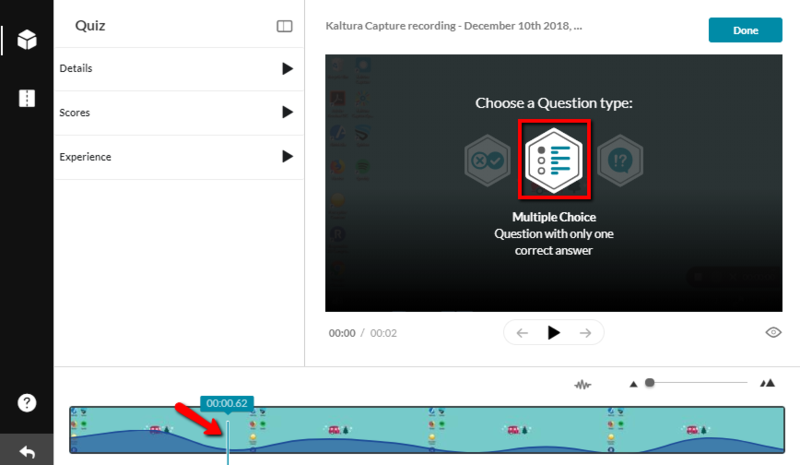 To add more questions, move the time cursor to the time spot you would like to insert the question and click the multiple choice option. To edit finished questions. 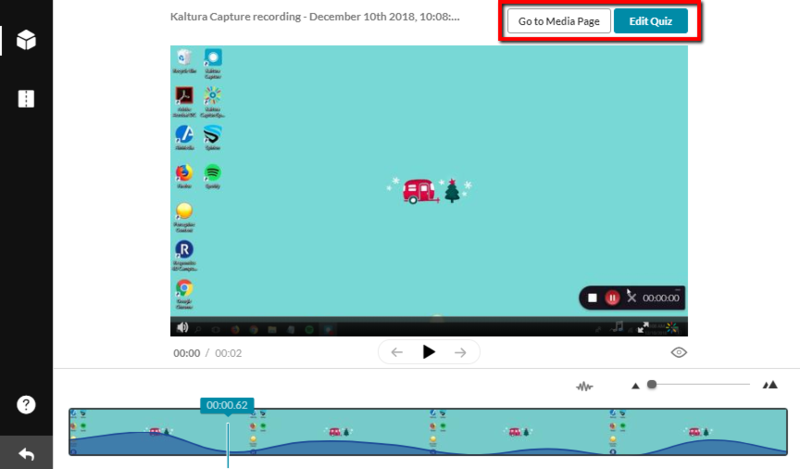 click the quiz icon on the video timeline. 13. When you have finished adding questions to the quiz, click the "Done" button and your work will be saved. 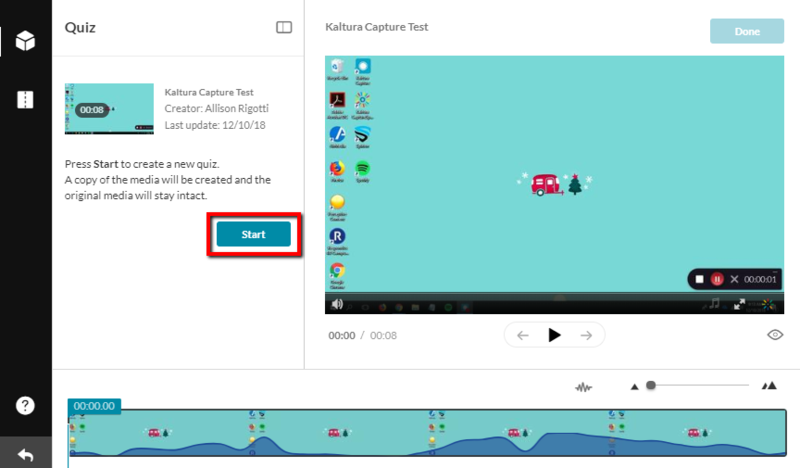 You will then have the option to edit the quiz further or return to the video. 14. You can share the video the same way as you normally would. 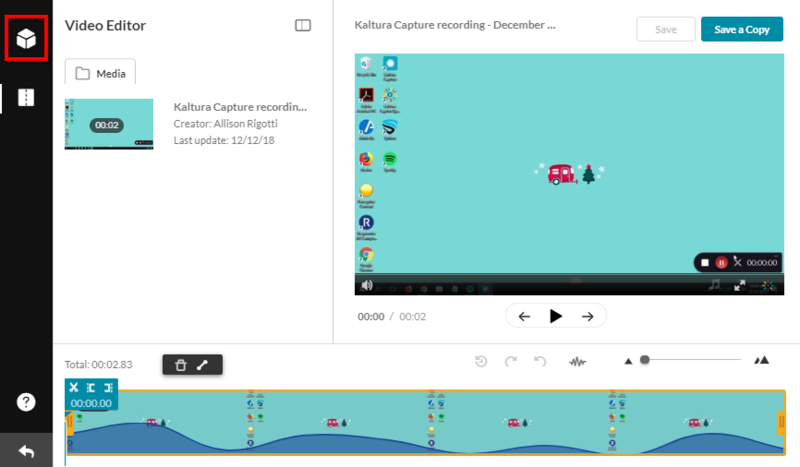 For more information on sharing Kaltura Capture videos, see the Knowledgebase article titled "Canvas - Sharing Kaltura Capture Videos".